Dumplings are a cheap and tasty addition to a meal, made traditionally of suet and flour rolled into balls and placed into the liquid of a savoury recipes. They are easy to prepare and are usually added to a meal such as soup, stew or casserole near to the end of the cooking time. Although we think of dumplings as being savoury and accompanying a stew it is also an excellent way to prepare a cheap and warming dessert meal as well. The basic recipe can easily be adapted for either use by adding sugar to the dry mix and serving with jam or golden syrup. Traditionally dumplings are made with shredded beef suet which can be purchased from most supermarkets. There is also a vegetarian version available although traditionalist will say that it is the beef suet that brings out the flavour. Some recipes use butter instead of suet and this does work, it is down to personal preference and taste. Why not try several versions to add variety to your meals? Add enough water to make firm dough.Divide into twelve equal portions and with floured hands shape into balls. Place into a stew for the last twenty to thirty minutes of cooking turning the dumplings once to make sure they are coated with the gravy from the stew. If you have a lid to your pan place it on top as this will aid the dumplings to steam cook. A skewer or knife placed into the dumpling should pull out clean showing the dumplings are cooked. Note: The dumplings will rise and can lift the lid off the pan and also cause a filled pan to overflow. Adding dumplings to any savoury meal will stretch the meal to feed more people. If you have unexpected guests a few dumplings with unusual flavourings will not only get you out of trouble when trying to feed more people but will show how clever you are with your recipes. Add a teaspoon of medium curry powder to the dry dumpling mix and add the dumplings to a curry for an unusual twist to the meal. These dumplings are ideal for people who do not like naan bread with their curry. Alternatively try half a teaspoon each of garlic powder, cumin and coriander for another curry type flavour. 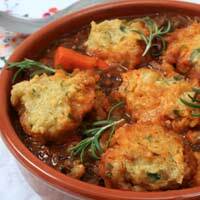 Two teaspoons of dried mixed herbs and a crushed garlic clove added to the dumpling mix make tasty dumplings to accompany a chicken casserole. A shepherd’s pie with a twist is to replace the mashed potato with a dumpling topping. Add the dumplings to the minced beef and vegetables whilst they are simmering on the hob. You do not always have to cook the dumpling in a stew or casserole. Simply make a stock using stock cubes and water and add the dumplings to the simmering water. Cover with a lid and cook for twenty to thirty minutes until cooked.